A lot of things you see as a child remain with you…you spend a lot of your life trying to recapture the experience. A dark and misty night begins once again. The giant monolithic building towers above the rest of the city calling on the end of another day. A tall dark and mysterious figure stands with his back to the wall. Black leather clings to his arms; two large black boots hang on his feet. He is alone. No one knows his name; no one knows how he feels inside; no one cares for him. Society has thrown him aside. He can never again be one of them. This is the world of Timothy William Burton. In the recent history of film, few people have actually created something so original that it could affect the whole industry. Tim Burton has produced an outstanding amount of films that bring up the question, is Burton one of these people? Could he just be an average, if off-centre, filmmaker who has managed to convince everyone he is great, or is he the brilliant visual artist who uses his talents to create great movies? Born in Burbank, California, Burton is, quite literally, a child of Hollywood—albeit a child who was considered by those around him, and by himself, a misfit who spent his days feeding on a steady diet of horror and science fiction. In a typical suburbanised area in Hollywood, this was, not surprisingly, considered strange behaviour. And so it is this sense of the eccentric, the outsider, which permeates all of Burton’s work. It was this environment which fostered the rampant imaginativeness that would later become his trademark. Ground out of most of us by adulthood, in Burton it nurtured a world of dark daydream and bright pastel nightmare—a world that we can glimpse in his films. Before long young Burton was making horror films with a Super 8 camera, but he felt more like an artist than a filmmaker. He began drawing at an early age, but, it wasn’t until he has spent some time at California Institute of the Arts, that he was given an opportunity that would change his life. Disney, after seeing Burton’s artwork, hired him immediately. Amazingly, they didn’t even have a job that specifically fit what he could do. He was hired on the basis that if Disney didn’t hire him, someone else would. Long and tedious hours were burned away as Burton worked continuously on creating ideas for Disney. What he came up with wasn’t exactly what Disney had hoped for. 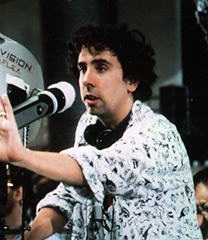 He developed two shorts, Vincent (1982) and Frankenweenie (1984). The first film was a ‘claymation’ tribute to his idol Vincent Price. Although not the most publicised film from the Disney Studios, it’s certainly the most unusual. The combination of bizarre characters and the constantly shifting expressionist backgrounds produced a film that may best be described as ‘The Cabinet of Dr Caligari meet Ray Harryhausen.’ The second short was about a boy and his dog. The dog is killed in a car crash, so the boy begins experiments to bring his dog back to life. This Frankenstein-inspired featurette is actually semi-autobiographical in nature, Burton having been left traumatised by the death of his pet as a youngster. Both films are drenched in the atmosphere of the old Hollywood horror films, and were equally influenced by the sensitive expressionism of James Whale. They both received an extremely limited release as Disney, following bemused responses from test screenings, did not really know what to do with them. It wasn’t long however before Burton received his first movie deal, working on Pee Wee’s Big Adventure (1985). 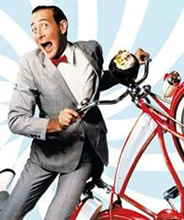 An infectious, intricately designed road movie built around TV personality Pee-Wee Herman, it received poor reviews, but with its chaotic and absurd comedic elements it made audiences giggle enough to make a good deal of money. This commercial success gave Burton a little more freedom in his selection of screenplays. He finally opted for Beetlejuice (1988), a black comedy about a dead couple disturbed in the haunting of their house by a snobbish city family intent on redecorating. Despite a lukewarm response, Beetlejuice became one of 1988’s sizeable hits, no doubt due to its unconventional structure and sprinklings of dazzling genius, such as Burton’s exuberant mix of slapstick horror and social satire, and in no small measure due to Michael Keaton’s wonderfully childish performance. The following year Burton made his most financially successful, and arguably least personal, film Batman (1989). As blockbusters go, it’s still pretty good, even with its many flaws. Taking its main influence from the comic book Batman: The Dark Knight Returns, the film brings the dark power and gothic mystery back to the Caped Crusader. Batman represents the outsider in the story—he is a man who, after watching his parent’s murder, has separated himself from society and is dedicated to single handily stopping the criminals of the city. Even in his normal guise as Bruce Wayne, he is presented as a person detached from the rest of society. 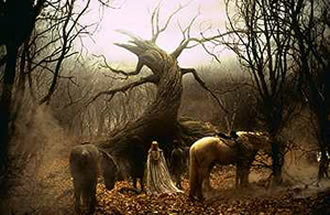 Burton was allowed freedom in the set design to create a world that is visually stunning. He uses the tall, dark gothic architecture to draw the viewer into the dark world of crime and vengeance in which Batman resides. Batman is going to make sure that what happened to him will never happen to anyone else, and Burton heavily uses specific colours in the lighting to affect the mood—giving the film a comic book feel that is now used in many popular movies of similar genre, most recently Daredevil (Mark Steven Johnson, 2003). The dark world, or society that plagues the streets, represents something that the average viewer can relate to. 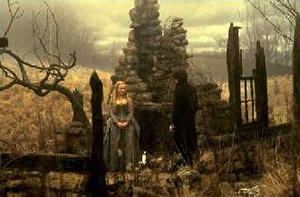 Burton used his creative and artistic abilities to draw the viewers into the film. It is not surprising that even though Burton was restricted in his characters and plot line, his visual interpretation of a comic book has set a standard in the industry for what “a good comic book flick” should be. Burton went onto direct a Batman sequel for Warner, on the condition that he would have complete creative control over the entire production. Batman Returns (1992) generally received better reviews than its predecessor, but it came in for a lot of criticism because of the overwhelmingly dark atmosphere, with many parents finding the film far too intense for children. 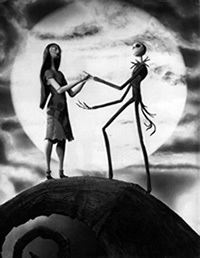 The film itself is a worthy extension of the first offering—dispensing with realism and aspiring to animation, to the freedom of idea and image, which Burton would later explore fully in Tim Burtons The Nightmare Before Christmas (1993). 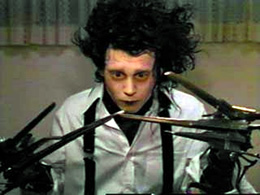 Edward Scissorhands (1990), one of his first well-received films, serves as an excellent example of his distinctive vision. It is in many ways the masterpiece in Burton’s opus. The disparity between Burton’s horror movie sensibilities and his mundane suburban upbringing in Burbank is conveyed in one of Scissorhands‘ earliest and most audacious sight gags: Dianne Wiest, in a hilarious turn as a plucky suburban housewife Peg, is doing what the pre-feminist housewives of Burton’s childhood might have done on a sunny Burbank afternoon: selling Avon cosmetics door-to-door. She’s not having much luck, but there is that one last house on a craggy hilltop—a house that might have come straight out of Roger Corman’s The Pit and the Pendulum (1961), a brooding and dilapidated Victorian manor, glowering inexplicably down on the otherwise picture-perfect streets. Inside the old mansion lives an odd boy with no hands—Edward (Johnny Depp). As Edward walks out of the shadows Peg, seeing his scissorhands and scarred face, recoils in shock. But upon hearing Edward’s childlike voice pleading with her not to go, Peg does what any caring Avon-seller would do—she applies Avon—much to the bemusement of Edward and to the amusement of the audience. This initial awkward encounter is a precursor to the entire fish-out-of-water narrative of the film. Significantly, Peg’s failure to ‘cure’ Edward’s scars can be seen as a bittersweet foreshadowing of her inability to ‘cure’ Edward of his status as outsider by taking him into town—where Peg sees a harmless little boy with no hands and facial scars, the rest of the town see a freak with scissorhands. This strange character is, symbolically at least, Burton himself. Scissorhands is nothing less than Burton’s spiritual autobiography—a fairy tale of the “otherness” felt by every outsider. With his fright wig, imploring eyes and pruning-shear hands, Edward is the king of freaks—a walking sight gag (and a triumph of visual design) carved out of the junk culture—which adolescents of Burton’s generation crammed into their brains. The simple, mythic power of Edward’s predicament—with blades in place of fingers, he injures everything he touches—speaks to the teenage alienation, which was so clearly a part of Burton’s early life, and to the fear shared by many creative people that what makes them special also sets them apart. Like Terry Gilliam’s Brazil (1980), Scissorhands stands out as one of those rare gems from Hollywood—an extremely personal film. Edward represents, among other things, a childlike sense of wonder, an adolescent’s clumsiness and someone who longs to touch others without hurting them. The real precedent for Scissorhands isn’t Batman at all, but the surreal, gothic shorts Frankenweenie and Vincent. Both films featured “fish out of water” themes in which elements of gothic horror were introduced into a contemporary suburban milieu, and both were deadpan comedies which suggest, as Scissorhands does, that the evils of suburban living were far more terrifying than anything a mere mad scientist could cook up. 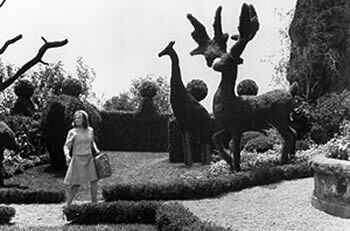 These basic elements, which blossomed in Scissorhands, were present in Burton’s work from the beginning—a fact he acknowledged by casting Vincent Price (who narrated Vincent) as Edward’s Frankenstein-like creator. Burton’s love of the old A.I.P./Vincent Price horror movies is one of the key sources for his visual sense. In Scissorhands, Price reciprocated Burton’s affections by delivering a gently self-mocking performance that was to be his final screen appearance. By playing the man who created the shy and befuddled Edward, Price was, in a metaphoric sense, embodying on-screen his role as Burton’s muse and creative father. Anchored by a stunning, Keatonesque performance from Depp, Scissorhands is a work of whimsical style and substance, made by a director at the height of his imaginative powers. The film’s final images—of Edward, alone in his fortress of solitude, sculpting ice figures for companionship while scissor-fingered snowflakes miraculously float down onto the sleeping suburb beneath—are among the most moving of the era. With Scissorhands, Burton reached a high point of poetic lyricism that is all the more remarkable when viewed against the brutality and literalness which characterises many offerings in contemporary cinema. Burton’s next project was a film based on the life of “Worst Director of All Time,” Edward D. Wood Jr. But in spite of Burton’s impressive resume, it was difficult to find a studio that would take it on, especially since Burton insisted the film be shot in black and white. Finally Burton remained with Disney as the project went into production at Touchstone Pictures, Disney’s adult branch. 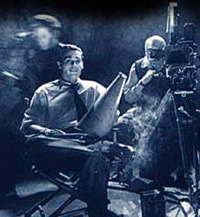 Ed Wood (1994) turned out to be the first commercial failure in Burton’s career, despite the unanimous praise heaped on the film by critics. 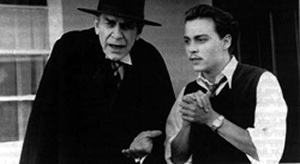 Shot in glorious black and white, Burton re-utilised Johnny Depp as the eponymous director and cast Martin Landau as a debilitated Bela Lugosi. While smaller in scope than his last three outings, Ed Wood was also the first Burton movie to be grounded in a truthful, if bizarre, historical reality, unlike the internally consistent but fictional worlds of Edward Scissorhands and the Batman series. Furthermore, Wood’s bumbling efforts at merging fiction and reality provide an effective counterpoint to Burton’s own achievements in elucidating the often fragile distinctions between fact and fantasy. The film’s characters are frequently confused as to whether Bela Lugosi, who portrays the “undead” Dracula in the movies, is really dead. Lugosi is frequently told that he’s more frightening in person than in the movies, remarks that Lugosi foolishly accepts as compliments. Burton then dramatises these comments by portraying Lugosi’s drug rehab with full chamber-of-horrors screams and effects. A different sort of twist is taken with horror film conventions used to create tension and foreboding, as Burton manipulates a potentially terrifying scene, a power failure during a carnival spook house ride, to stage the proposal scene of Ed and Kathy Wood. More poignant are the lines Wood pens for Lugosi in his 1955 film, Bride of the Monster (“haunted, despised, living like an animal…”) which became more of an epitaph for the real-life Lugosi than for his film character. Taking a direction, which initially seems as far detached from Ed Wood as one could imagine, Mars Attacks! (1996) immediately announces itself as a pastiche of the 1950s alien invasion film. Derived from a series of Topps trading cards produced in the early 1960s and quickly withdrawn as a result of its excessive, gratuitous violence, Mars Attacks! stands in direct contradistinction to other big-budget sci-fi films of the 1990s like Independence Day (Roland Emmerich, 1996). Burton uses his state-of-the-art special effects budget to make space ships that aren’t impressive modern effects standards; rather they look exactly like the cheesy flying saucers from the ’50s films. And like any self-respecting childish, pop culture product, the film provoked grown-up disapproval. Offering a sentimental catalog of Cold War extraterrestrial-invasion clichés, Mars Attacks! is irresistibly perverse in its state-of-the-art tackiness and allusion to old B-movies both good and bad. Danny Elfman’s musical score explicitly recalls the classic The Day the Earth Stood Still (Robert Wise, 1951) while actor Pierce Brosnan, playing the scientist role, seems to be channelling Richard Carlson (the original B-actor who created so many of those characters)—complete with wooden B-movie delivery and an ever-present pipe. Such explicit genre pastiche invites the viewer to consider the film critically—as a text that has something to say about the genre itself. As with the Bela Lugosi character in Ed Wood, Burton’s heroes in Mars Attacks! are those who have suffered from the effects of fame, substance abuse and/or cultural decay. They blindly and pathetically search for cultural values and achieve success almost in spite of themselves. Rather than being merely a nostalgic reworking of the genre, Mars Attacks! successfully unravels its ideological assumptions. In 1999, Burton reunited with fellow outsider Depp for the third time in Sleepy Hollow—a loose adaptation of Washington Irving’s classic short story The Legend of Sleepy Hollow. Depp plays Ichabod Crane not as the original story’s schoolteacher but as an inventive and fussy New York City constable with an avant-garde approach to solving crimes. Crane is sent to the hamlet of Sleepy Hollow to investigate three murders in which the victims were decapitated and taken. Upon his arrival, Crane tries to debunk the town’s myth of a “Headless Horseman.” But he’s soon convinced there’s more here than meets the eye. In many ways this film, with its dreamy, macabre gothic atmosphere, works as homage to the Hammer horror films Burton watched in fascination as a child. Although populated by flesh and blood actors, Burton’s Hollywood fright-fest (though not actually very frightening) is as ruthlessly stylised as the Disney animation that breathed a comic chill into Irving’s ghostly yarn in 1948. It is the perfect showcase for Burton’s strange sensibility. Shot in monochromatic tones with splashes of bright red, Sleepy Hollow is a visual delight, and although one of Burton’s more literal offerings, his special brand of the childish nightmare inhabits every frame. Burton’s most recent filmic offering was also his most lacklustre. His remake of Franklin J Shaffner’s 1967 sci-fi fantasy Planet of the Apes has several damaging flaws, including the fact that it cares little for its human characters. Planet of the Apes, the original, garnered critical acclaim for the way in which it reflected a changing America at the time. In Burton’s defence, the issues of the day have changed quite significantly (the remake is certainly less political), and the film succeeds in raising many questions about man’s capacity for experimentation and destruction. In many ways, and not surprisingly, Burton’s new Planet of the Apes is more visually striking than the original. Yet Burton has little to offer but a refinement of the first film’s imagery, and the overall presence of his own distinctive imagery is at times conspicuously missing. Only in the closing scene is the cheesy, irrational nightmarishness of the Burton aesthetic really glimpsed. The hero (Mark Wahlberg) returns to Earth to be met by a statue of an ape general in place of the Lincoln memorial, and is apprehended by police-apes. Ape citizens and gorillas in uniform, in their familiar surroundings, carry the audacious charge of a sci-fi monster film from Burton’s childhood, where the absurd is at once scary and funny. The dark side of Hollywood or Hollywood’s biggest commodity? The question is why has Burton been allowed such a long leash? Though I have cited his strength of personal vision as a major factor, some would argue (rightly so in some ways) that his very success and unique “selling point” has been commercialised by the Hollywood system. After all, as I’ve already stated, Burton is certainly a director whose films are uniquely recognisable and consistent, thematically as well as visually. From his first short Vincent up to and including his most recent feature Planet of the Apes, there have been a number of recurring themes, making his name a sort of trademark for a certain style and content. Besides that, there has been a stable and recognisable image of ‘Tim Burton: The Director’ since the release of Batman. Publicity photos show him to be a thoughtful artist with unkempt hairdo, while interviewers always stress his physical demeanour. The name ‘Tim Burton’ comes to stand for stylised films about outsiders with a recognizable gothic design, just like the name ‘Woody Allen’ has come to stand for angst-ridden urban comedies with a mousy intellectual who is instantly and totally identified with the director as main character. Admittedly Burton has taken some risks, but we must look back upon what he was trying to accomplish. Burton uses the strange actions of the characters to show the internal childishness of the outcast character. It is very important that these actions be out of place to show this. In the example of Beetlejuice, it was important for the other characters to shrug off the strange incidence in order to show that the dead souls were not being successful in there attempts to scare off the living. This use of character reaction allowed Burton to show the depth of the characters’ strengths and weaknesses, and it allowed the audience to see just how strange the new homeowners really were. In spite of the charges thrown in his direction, Burton has managed to keep a continuity in his body of work, and is unquestionably an astounding and original visual artist. But are his films truly unique visions? The role of the director in contemporary Hollywood is full of contradiction. Some directors have a recognizable and distinctive style and/or thematic content which turn their body of work into an oeuvre and themselves into auteur. Burton is one such filmmaker, a director who has earned the status of auteur, although he is not viewed in the same category as, say, Martin Scorsese. He is the perennial outsider on the inside. Like James Cameron, he works within genres that are not readily accepted as “art,” but by now Burton’s oeuvre is so uniquely recognisable that critics are hard put to classify his work. Love him or loath him, Burton is a director who has made an impact—both in the industry and on the cinema-goers—and whose films, so special in their childlike reverie and cathartic blend of horror and black humour, warrant his inclusion amongst the great visual filmmakers of past and present. Links to several online articles can be found here. Very comprehensive site with lots of news, reviews, articles and multimedia. Affectionate fan site dedicated to Burton. Useful site including complete listing of Tim Burton’s credits and his films box office rankings, as well as other little known facts. Ben Andac lives in his local cinema in London and is a freelance writer.